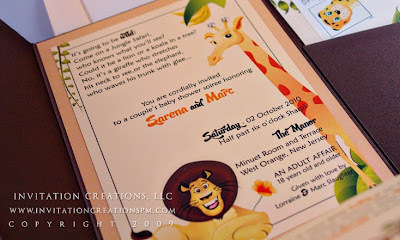 So these have to be the most detailed and sophisticated baby showers I've created to-date. I can't believe I was lucky enough to work with someone who wanted something out-of-the-box for her son's and girlfriend's baby shower. Yep, this was going to be my client's (Lorraine) first grandchild. I know this child is going to be loved!! Every aspect of this baby shower was out-of-the-box. This event was more on par with a wedding than a baby shower. She hired a DJ for the evening (yep, evening affair), she had a full bar and heavy hors d'ouevres. Their is a dress code, Jackets required at this venue and the venue was The Manor in West Orange NJ which is a venue where lots of couples get married. To top it off, the affair was a surprise bash for the baby's mommy and her son. Since this a more formal affair, Lorraine wanted the invitations to reflect the event. She wanted a jungle theme. No monkeys was the only request. She wanted to make sure the design aspects were featured on every piece of paper. She also wanted a mailed response, directions card and a registry card. She saw something on my website that she loved and then wanted an itinerary for the evening as well. FOUR inserts!! Holy cow!! Most of my brides don't do that many, but Lorraine isn't like most people. 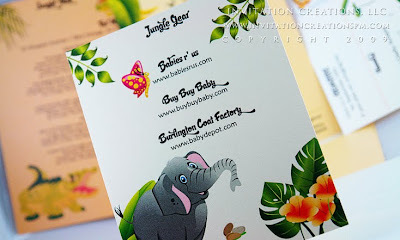 She wanted it to be an elegant, formal baby shower with a jungle theme. The pressure was on to deliver! 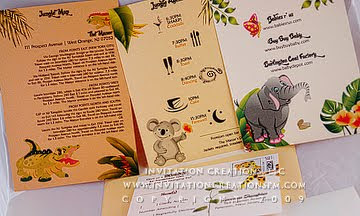 With four inserts and tons of information to include, we still needed to address the surprise element to the guests. So, I designed a custom envelope liner. In the final version, we also mentioned it on the cover of the envelope for those peeps who slice their mail with those mail cutters thus never opening the flap of an envelope. 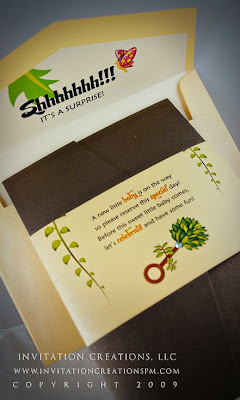 She also had a little baby shower poem that she wanted incorporated and she loved the jungle rattle. So I created a belly band to wrap around the pocketfold with these items on it. 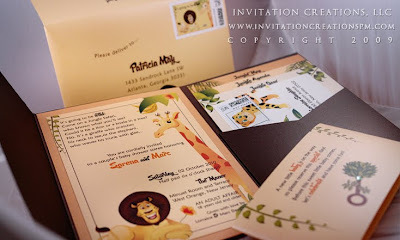 We couldn't go all out on this invite and then put some random stamp on it! 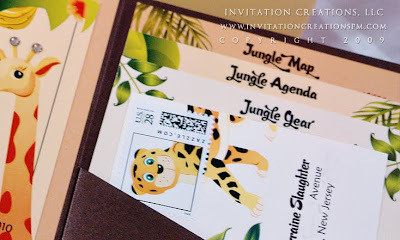 Oh no, we created custom jungle stamps to coordinate with all the other pieces. And last but not least, we added a little bling to the invitation. LOVE LOVE LOVE!! I also addressed all the envelopes for the guests. Now, if you received this in the mail would you want to go? Congratulations, Lorraine!! !I know you must be overjoyed with your new grandson! !